The Seafarers Handbook for Australian Waters (AHP20) is an official nautical publication providing mariners that with important m­aritime information from various Australian government agencies under the cover of one combined reference. It is expected that all commercial vessels operating in Australian waters carry and refer to the publication. Major Australian maritime legislation and regulations, and responsible agencies. Marine Protected Areas, regulations and responsible agencies. Torres Strait and Great Barrier Reef shipping routes, accident and incident reporting. Maritime Safety Information, meteorological broadcasts, Warnings, search and rescue. Ship Reporting Systems - AUSREP and REEFVTS. Maritime security, Customs, biosecurity, quarantine and immigration. Australian trading ports – Pilots, boarding arrangements, VHF Channels, ETA and port contact details. Key contact information for each relevant government agency and links to further information. 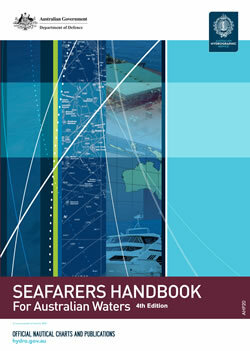 The Seafarers Handbook for Australian Waters is published as a paper book and may be purchased from chart distribution agents. A separate supplement (see below) may be downloaded from this website as a free PDF. supplied automatically via the free eNotices email service. Instructions on how to update the publication are included in the Australian Chart & Publication Maintenance Handbook, also published by the Australian Hydrographic Office. 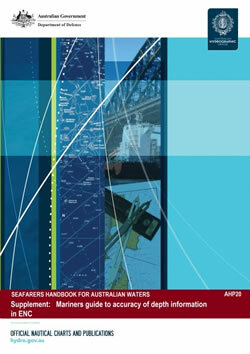 The current edition of the Seafarers Handbook for Australian Waters is Edition 4 (2016). A new edition is intended for publication in 2019. A supplement to the Seafarers Handbook for Australian Waters has been published (Nov 2018) in response to feedback from shipping industry representatives and the Australian Maritime Safety Authority. It is intended for use by mariners and maritime training organisations to address a number of misconceptions amongst mariners regarding the accuracy of bathymetry within Electronic Navigational Charts (ENC) and the impact that accuracy should have upon route planning and conduct. The supplement may be downloaded as a free PDF publication. The content of this supplement will be fully incorporated into the next edition as the new Chapter 13 in 2019. The content has also been offered to the International Hydrographic Organization for publication as an IHO standard.